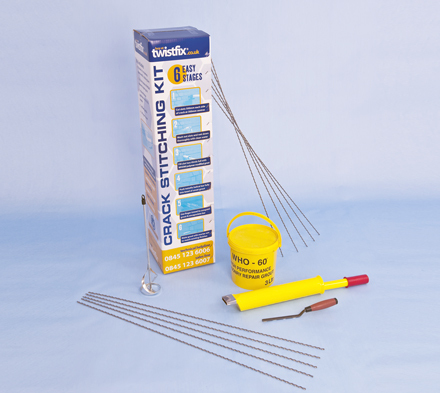 Builders and refurbishment specialists now have a wider choice when it comes to wall crack repair systems.­ The introduction of a heavy duty crack stitching kit option compliments the standard kits and enables users to select the most appropriate repair pack for a specific application. The 8mm Twistfix heavy duty crack repair rods contain over 60% more stainless steel than the standard helical bars. This extra strength is the reinforcemnt provides much greater resilience to cracking derived from sheer loads in masonry. Often used to repair cracks in stone walls the more robust heavy duty bars are the choice of the professionals for heavy duty wall crack repairs. For more information contact us 0845 123 6007 or email info@twistfix.co.uk.